Cables: Kimber Select KS-1030 silver ICs, Kimber Select KS-3035 silver/copper speaker cable, Artisan Silver Dream ICs, Kimber High Current power cord, JPS Kaptovator power cords. Amidst my ramblings in the UK's Audio World 2011 show report is a mention of the Daedalus Audio/First Sound/Modwright room showcasing the DA-RMa speakers, AMR CD-77, First Sound valve preamp and Modwright KW150 Special Edition class A/B amp. Also mentioned was an after-show listening session resulting in my interest to review either the Modwright amp or First Sound. A subsequent offer from designer Emmanuel Go later in the year ensured the latter was being shipped to my good self. Holder of a Bachelors Degree in History/Political Science, Emmanuel's journey into preamp design is an interesting one. Introduced to high end audio in the 10th grade, he had always been keen on sound, music and electronics and by 1988 had built a high-end system using a CD player with volume control. After borrowing a preamp from his local dealer which sounded 'horrible' in comparison with the CD player's volume control, he set himself the challenge of building a better volume control. This resulted in a dual ladder type attenuator with performance he says astonished him. Shortly after in 1989, Emmanuel moved to Seattle. Not finding a job that suited him, he thought "why not sell this passive that I made, it’s so good that I cannot imagine people would not want to buy it". This effectively was the start of First Sound. 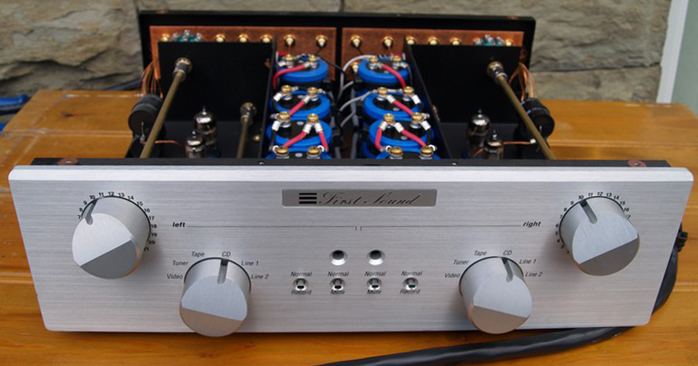 After an intensive six months of research into all aspects of passive design such as wire, topology, parts, solder etc., the First Sound Reference Passive Preamplifier was born. It was followed shortly after by the Reference Passive Preamplifier II and finally the Reference Passive Preamplifier Signature. In the fall of 1992 the Presence Audio name was introduced as the brand that would differentiate active from passive preamps. Two active models were introduced, the Presence and Presence Deluxe. By around 1994/5 the active preamp was outperforming the passive. Presence Audio was then dropped and First Sound adapted to represent both the active and passive preamps. Since then the active line stage has steadily progressed to the current MkIII version I had for review. 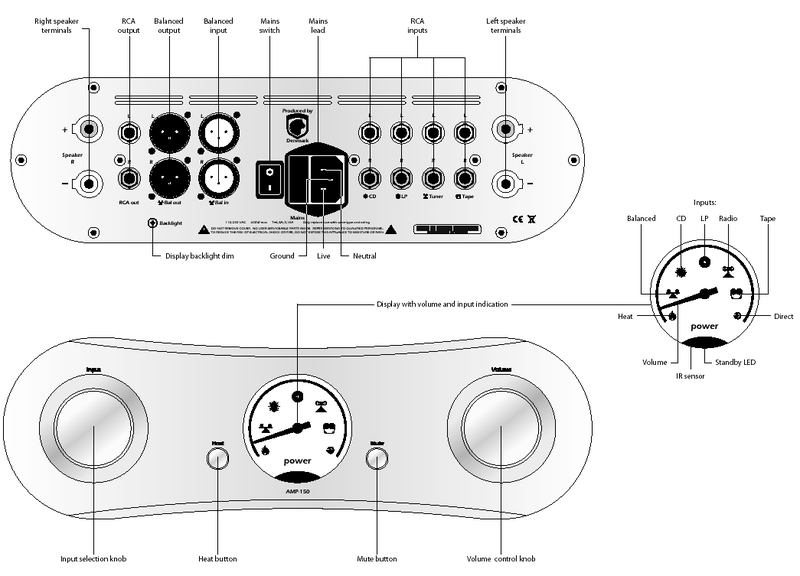 To summarise the guiding philosophy behind Emmanuel's designs, "the quality of First Sound passives, primarily how purity of the signal is maintained, has been an ideal. This ideal has been maintained through the active line stages or has been the driving force behind them." Out of the box.The Presence Deluxe MkIII and its external power supply arrived in separate boxes, the main chassis box weighing in at 40lbs and measuring 23" x 19" x 11" whilst the power supply box tipped the scales at 18 lbs and measured 17" x 13" x 10". A deft few swipes with a razor blade quickly revealed the contents of both boxes. Plastic foam cradles were removed from either end of the main chassis before the protective plastic bag was slipped off. Very little of the 40 pound weight attributed to the actual packaging, with the Presence being reassuringly heavy even minus the power supply whose own copper-plated steel chassis has to be connected via a dedicated umbilical cord made up of four pairs of twisted wire, each pair having a full 100% shield and a drain wire plus an overall shield and drain wire. The cord is hard-wired to the pre and at the power supply end fastened using a four-pin socket with an aluminium locking ring. Putting the power supply to one side, anyone wishing to know where the Big Knobs hang out need look no farther than the Presence's 3/8-inch fascia where four 44mm diameter alloy dials stand 30mm proud of the faceplate. A bank of four toggle switches are positioned between the knobs below the twin blue LEDS but if we were to draw a vertical line down the center of the fascia, both sides would be an exact mirror image. The Presence Deluxe is a true dual-mono design and is fastidiously constructed as such, from fascia controls right through to RCA (no XLR) outputs. Even the power cord enters in the center of the rear chassis plate to feed both sides equally. This being the case I'll give a brief description of the left side controls only. From left to right we first have the attenuator, the quality of which can make or break a preamp. 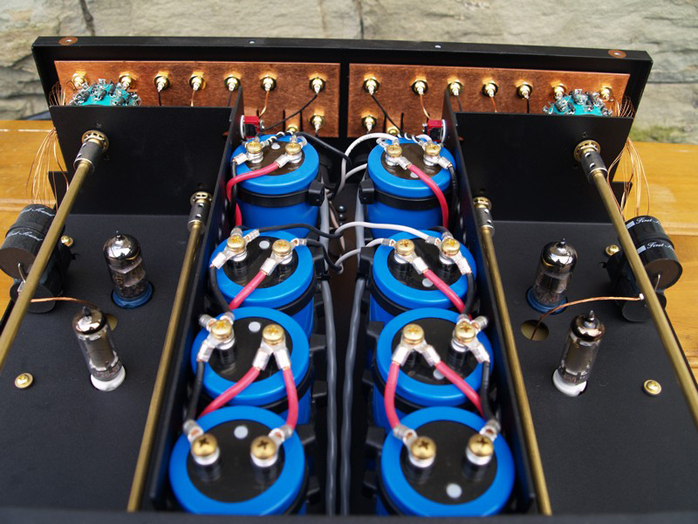 As the Presence Deluxe basically evolved from a passive which is built around the attenuator, this was never going to be an Achilles heel and all attenuators are hand-crafted by Emmanuel himself. For this LTH92 attenuator, 46 high-quality Holco metal film resistors are configured in a ladder type configuration with 2dB steps over most of the volume range. Each resistor for the discrete left and right channel attenuators is matched precisely to within 0.2% accuracy. The tail of each resistor is crimped to one side of the switch only after being looped around it before being soldered to the lug to ensure the very best mechanical and sonic integrity. 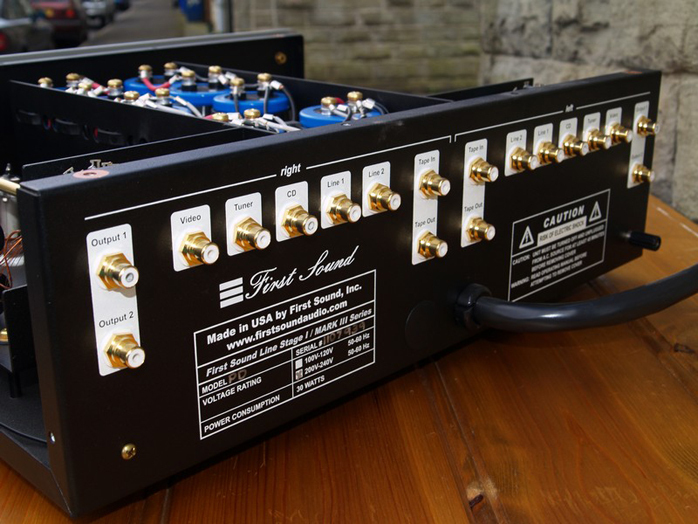 The switch itself, also used in the input selector, can handle a massive 25-amperes load and follows the theme running throughout the design of the Presence Deluxe - that of ensuring plenty of headroom and no bottlenecks in power supply or signal transfer.